The Delphic Trust, which operates the Delphic Club, has filed a civil action suit against the President and Fellows of Harvard College and a construction company—Shawmut Woodworking & Supply, Inc.—for negligence and nuisance, according to court proceedings released by the Middlesex Superior Court. The Trust is attempting to recover monetary damages of approximately $300,000 from Harvard and the construction company for allegedly damaging the Delphic’s rain leader system during the renovation of the Hasty Pudding Club building. According to the complaint, the project caused subsequent water damage to the Delphic Club when the system failed to operate properly during a heavy rainstorm in January 2012. 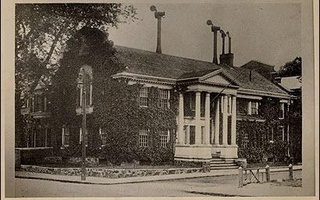 The Pudding building, which was previously known as the New College Theatre and has since been renamed Farkas Hall, is located at 10-12 Holyoke St., adjacent to the Delphic Club at 9 Linden St. The complaint—filed by the Delphic Trust on Oct. 18—said that members of the Trust had met with Harvard officials before renovations began to “discuss the planned renovations of the Pudding and the impact of those renovations on the [Delphic]” and to advise Harvard to take precautions during the renovations so as not to damage any of the pipes in the Delphic’s system. While Harvard allegedly agreed to investigate the drainage system behind the Delphic Club, the Trust declared in its tort action that no one ever did so, leading to the damage of the system. Harvard completed the renovation of the Pudding building in 2007. According to the filings, the Trust began to notice signs of water damage to the Delphic clubhouse in 2011, including “mold in the basement” and non-functioning drains in the patio. After the 2012 rainstorm, which resulted in partial flooding of the building and damage to the patio, the Trust began investigating the cause of the overflow. The investigation revealed, according to the court docket, that one of the pipes in the Delphic’s rain leader system had been crushed by “installations of drywall and concrete” believed to be carried out by Shawmut during the renovations of the Pudding. The complaint cites numerous repairs that the Trust had to undertake in order to repair the water damage to the Delphic, including re-routing the entirety of the underground rain leader system, renovating several basement rooms, repairing the patio, and removing mold. Since the rainstorm, the Trust has sought the blueprints of the Pudding’s renovation. According to the docket, Harvard representatives have so far failed to deliver such blueprints, although they allegedly promised to do so. University spokesperson Kevin Galvin wrote in an email to The Crimson that Harvard had not yet been served with a copy of the complaint and so was not in a position to comment on this suit.Delphic Club president Owen Fox ’13 declined to comment on the case in question. —Staff writer Antonio Coppola can be reached at antonio.coppola@thecrimson.com. Follow him on Twitter @AntonioCoppolaC. —Staff writer John P. Finnegan can be reached at finnegan@thecrimson.com. Follow him on Twitter @finneganspake. 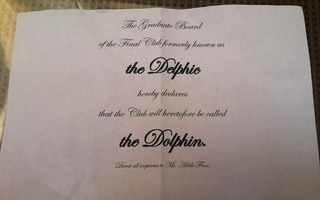 The Delphic Renamed "The Dolphin"
Many students fled from parties this weekend, after Cambridge police officers showed up at final club parties and asked club officials to keep the noise down. With the questionable wisdom of strangers in mind, FM would like to take a moment to highlight a few of Yelp’s rising star(rer)s.
President: Maybe this whole scandal will be a good thing after all. We’re getting the attention we deserve.